Emeraldia (エメラルディア, lit. 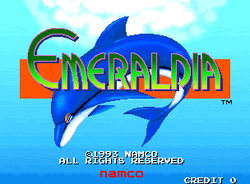 Emerarudia) is a puzzle arcade game which was released by Namco in 1993, only in Japan; it runs on the company's NA-1 hardware, and was the eighth game from them to allow scores not ending in "0" (and the third of this type that didn't use a Yamaha YM-2151 for music). This game has three modes of play; Adventure, Normal and Versus. In all three modes, the players must line up blocks of a particular colour - and when three blocks have been lined up (vertically), they will crack. Once a fourth block of that same colour lands on the three cracked ones, they'll all shatter; for Adventure Mode, the object is to get the trapped sea creatures down to the bottom of the screen. This page was last edited on 1 May 2014, at 17:00.